Everyone knows that the Audi R8 V10 is a superior sports car in every way. With a 5.2-liter FSI V10 pumping out 518 horsepower, the R8 should presumably then, leave the TT RS in it's dust. 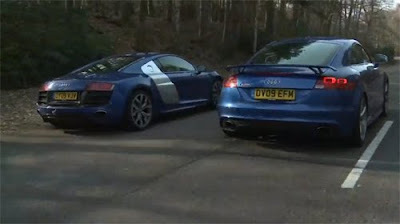 Well, you may be surprised by how well the Audi TT RS keeps up with it's big brother on Autocar's twisty test track.